WrapMail, Inc. (WRAP) announced today that it has modified it’s toolbar for Google Chrome users to also be compatible with GoDaddy webmail. WRAPmail has developed toolbars for “WRAPPING” regular emails in corporate or personal email stationery for Google Chrome, Firefox, Microsoft Explorer and Safari. From before these toolbars are compatible with Gmail, Yahoo Mail, AOL Mail and Microsoft Live/Outlook/Hotmail. “GoDaddy is the world’s largest hosting company and their users often use the webmail feature they offer, now all these users can also use WRAPmail and stay with the interface they are used to” says Rolv E. Heggenhougen, CEO of WRAPmail. * Largest worldwide mass-market hosting provider by annual revenue. Source Tier1 Research, Mass-Market Hosting Report – Winter 2011. The idea behind WRAPmail’s email marketing approach is to utilize the everyday realities that almost everyone has a website, social network site(s) and also sends emails every day. These emails can become complete marketing tools and help promote, brand, sell and cross-sell in addition to drive traffic to the websites and help conduct marketing research (through tracking analysis). WRAPmail is available for free (with 3rd party ads) or for a license fee. No routines change as users simply download a toolbar for their webmail or route emails via Google or WRAPmail’s servers. While the focus is on one-and one email, WRAPmail also offers an Enterprise solution where clients can send unlimited email campaigns using the same technology that avoids the RED X when emails arrive. Wrapmail’s solutions are built so that recipients see images right away and are not as quick to discard the email due to the lack of seeing anything enticing or for being afraid of viruses when they would otherwise download the images. WRAPmail’s revenue models are Advertising Revenue through our own Ad Network where users can advertise in other user’s emails (predominantly in the free user’s emails), license fees from ad-free and Enterprise clients, custom WRAP design (free if the user uses WRAPmail’s built-in WRAPmaker), per mail sent fee for email campaigns and Premium licensed Sports Team and Celebrity WRAP Sales to Fans. WRAPmail is a Google Apps vendor and also compatible with Google Analytics. WRAPmail also offers an automated solution where users can sign up with their Facebook account and have a WRAP automatically created based on their profile. Sign up for WRAPmail at http://www.wrapmail.com – top of page chose either Facebook signup or Business signup (for any signup other than Facebook). Furthermore, WRAPmail helps search for missing children with every email sent by free users by incorporating an RSS feed from the Center for Missing and Exploited Children – see Huffington Post article by clicking here. Matters discussed in this press release contain forward-looking statements. The words “anticipate,” “believe,” “estimate,” “may,” “intend,” “expect,” and similar expressions identify such forward-looking statements. Expected, actual results, performance, or achievements could differ materially from those contemplated, expressed, or implied by the forward-looking statements contained herein. Forward-looking statements are subject to a number of risks and uncertainties, including but not limited to, risks and uncertainties associated with, among other things, the impact of economic, competitive, and other factors affecting our operations, markets, products, and performance. The matters discussed herein should not be construed in any way, shape or manner of our future financial condition or stock price. For more complete information regarding our business and financial condition, you may access our filings at otcmarkets.com. October 18th, 2012– WrapMail, Inc. (WRAP) announced today that the Company has released a FREE version of its Enterprise Campaign System. This solution will have 3rd party ads outside the WRAP from WRAPmail’s Advertising network and from Partner networks such as Google and Market Leverage. WRAPmail has already signed on 4 clients for the FREE Campaign solution which represents about 500,000 email sends weekly. This also means 500,000 plus impressions of the 3rd party ads and if from WRAPmail’s ad network each impression generates $0.005 in Revenue. In addition WRAPmail charges a minimum of $0.25 per click. There will be a minimum of 6 ads per email/WRAP. WRAPmail’s advertising network lets advertisers create their own ad after setting up a WRAPmail account (which can be a free account with no requirements for usage) and a monthly budget. This is the same advertising network WRAPmail also uses in the regular system for Free users where the focus is on “WRAPPING” one-on-one emails; emails that we all send every day anyway to people we know. Clients go through an approval process as far as their mailing lists to secure that Spammers are weeded out. “I expect that this free solution quickly could grow to millions of emails being sent on a weekly basis and the beauty is that clients that sign up eliminate their current expense of sending mass emails, newsletters and other bulk emails to their subscriber and/or client base” says WRAPmail CEO, Rolv E. Heggenhougen. The basic idea behind WRAPmail is to utilize the fact that almost everyone has a website, social network site(s) and also sends emails every day. These emails can become complete marketing tools and help promote, brand, sell and cross-sell in addition to drive traffic to the websites and help conduct marketing research (through tracking analysis). WRAPmail is available for free (with 3rd party ads) or for a license fee. Toolbars are available to use WRAPmail with Gmail, Microsoft LIVE, Office365 (NEW), Yahoo Mail and AOL (available for Google Chrome, Internet Explorer, Firefox and Safari). Users of other email platforms can route their emails through WRAPmail’s servers or use the built-in webmail feature in the WRAPmail dashboard. While the focus is on one-and one email WRAPmail also offers an Enterprise solution where clients can send unlimited email campaigns using the same technology that avoids the RED X when emails arrive. Our solutions are built so that recipients see images right away and are not as quick to discard the email due to the lack of seeing anything enticing or for being afraid of viruses when they would otherwise download the images. This is the solution that is now available also for FREE /with 3rd party ads). WRAPmail’s revenue models are Advertising Revenue through our own Ad Network where users can advertise in other user’s emails (predominantly in the free user’s emails) and Google Affiliate Network, license fees from ad-free and Enterprise clients and Affiliate revenue from Super Affiliates. WRAPmail is a Google Apps vendor and also compatible with Google Analytics. Furthermore WRAPmail helps search for missing children with every email sent by free users by incorporating an RSS feed from the Center for Missing and Exploited Children – see Huffington Post article by clicking here. Matters discussed in this press release contain forward-looking statements. The words “anticipate,” “believe,” “estimate,” “may,” “intend,” “expect,” and similar expressions identify such forward-looking statements. Expected, actual results, performance, or achievements could differ materially from those contemplated, expressed, or implied by the forward-looking statements contained herein. Forward-looking statements are subject to a number of risks and uncertainties, including but not limited to, risks and uncertainties associated with, among other things, the impact of economic, competitive, and other factors affecting our operations, markets, products, and performance. For more complete information regarding our business and financial condition, you may access our filings at otcmarkets.com. The matters discussed in this press release should not be construed in any matter, shape or form as indicative of the future value of the Company’s common stock or its future financial condition. Wall Street Equities Research has released its analyst research reports on WRAPmail, Inc. (PINK: WRAP), Netflix Inc. (NASDAQ: NFLX) and SuperMedia Inc (NASDAQ:SPMD). Full fundamental and technical analysis is available at www.wallstpromotions.com. The basic idea behind wrapmail is to utilize the facts that all businesses have websites and employees that send emails every day. These emails can become complete marketing tools and help promote, brand, sell and cross-sell in addition to drive traffic to the website and conduct research (all links are tracked, also reported via email in real time). WRAPmail can also be used to create personal email stationary based on social networks such as Facebook, YouTube, Twitter, Google +, LinkedIn and Slideshare or hobbies, interests, party invitations etc for anyone’s personal email. Wrapmail is available for free at www.wrapmail.com and wrapped emails arrive with no red x! WRAPmail also helps search for missing children with every email sent by incorporating an optional RSS feed from the Center for Missing and Exploited Children (either Amber Alert or Missing Children feed). WRAPmail is a Google Application Vendor and also compatible with Google Analytics. WRAPmail is currently in the growth stage of the company focusing on growing the number of users. The next stage for the company will be implementation of an ad-revenue model where users will have an option to opt in and share the revenue from 3rd party advertising. With billions of one-on-one emails (not bulk/mass emails) sent every day we believe the ad revenue model has the best potential for our company, users and shareholders alike. Matters discussed in this press release contain forward-looking statements within the meaning of the Private Securities Litigation Reform Act of 1995. When used in this press release, the words “anticipate,” “believe,” “estimate,” “may,” “intend,” “expect,” and similar expressions identify such forward-looking statements. Although expected, actual results, performance, or achievements could differ materially from those contemplated, expressed, or implied by the forward-looking statements contained herein. These forward-looking statements are based largely on the expectations of WRAPmail, Inc. and are subject to a number of risks and uncertainties, including but not limited to, risks and uncertainties associated with: the impact of economic, competitive, and other factors affecting WRAPmail, Inc. and its operations; its markets, products, and performance, and other factors detailed in reports filed by WRAPmail, Inc. with OTC Markets. WrapMail is featured in the Smart Selling Tools for Inside Sales 2010 ebook by Josiane Feigon and Nancy Nardin just released today. Free download here. email into a sales tool that helps brand market the company and promote products and services. clicking on what and when (also in real time), turning the system into a research tool. Marketing get the corporate message out. · Wraps are trackable. WrapMail’s wraps are also tracking, giving invaluable data back to both sales and Marketing. An “Immediate Click Alert” tells you who has just clicked on what link. per month, plus a onetime $150 signup charge that includes a free custom wrap.  To implement WrapMail, just SIGN UP. Recognized for creating new opportunities in marketing, branding, advertising, and publishing. Fort Lauderdale, Florida , January 11, 2010 – WrapMail today announced that it has been chosen by AlwaysOn as one of the OnMedia Top 100 winners. Inclusion in the OnMedia 100 signifies leadership amongst its peers and game-changing approaches and technologies that are likely to disrupt existing markets and entrenched players. WrapMail was specially selected by the AlwaysOn editorial team and industry experts spanning the globe based on a set of five criteria: innovation, market potential, commercialization, stakeholder value, and media buzz. WrapMail and the OnMedia Top 100 Companies will be honored at AlwaysOn’s OnMedia NYC event on February 1st, 2010, at the Mandarin Oriental Hotel in New York City. This two-and-a-half-day executive event features CEO presentations and high-level debates on which forces are disrupting user behavior and creating new opportunities in the marketing, branding, advertising, and public relations industries. The OnMedia 100 winners were selected from among hundreds of other technology companies nominated by investors, bankers, journalists and industry insiders. The AlwaysOn editorial team conducted a rigorous three-month selection process to finalize the 2010 list. Companies seem to ignore the single largest online advertising venue available: their own regular external emails. Why not use these emails to market the senders company? Why not multiply the sales-staff by “wrapping” the regular email in an interactive letterhead? No other marketing or advertising medium is as targeted as an email between people that know each other (as opposed to mass emails). These emails are always read and typically kept. WrapMail offers a solution that is server-based (i.e. compatible with all email clients), has a complete back-office with a WrapMaker, reporting etc and only charge $5 per user per month. WrapMail CEO, Rolv E. Heggenhougen states: “We are very pleased with the award and the fact that our unique interactive marketing approach is being recognized. This comes on the heels of WrapMail becoming a Google Solutions Provider and quickly gaining new clients around the globe”. Founded in October 2005, WrapMail is the world’s only interactive email utility that gives companies the ability to promote, advertise and track results with every outgoing email from every employee without installing any software. Headquartered in Fort Lauderdale, Florida, WrapMail wraps outgoing emails in up to 4 frames with pictures, graphics, text and links. There is never a need to change any routines on the desktop and the technology ensures delivery, as well as the integrity of the design when viewed by the recipient. AlwaysOn is the leading business media brand networking the Global Silicon Valley. AlwaysOn helped ignite the social media revolution in early 2003 when it launched the AlwaysOn network (alwayson.goingon.com). In 2004, it became the first media brand to socially network its online readers and event attendees. AlwaysOn’s preeminent executive event series includes the Summit at Stanford, OnMedia, OnHollywood, OnDC, OnDemand, Venture Summit Silicon Valley, Venture Summit East, GoingGreen, GoingGreen East, and GoingGreen Europe. The AlwaysOn network and live event series empower readers, event participants, sponsors, and advertisers to spearhead the global innovation economy. 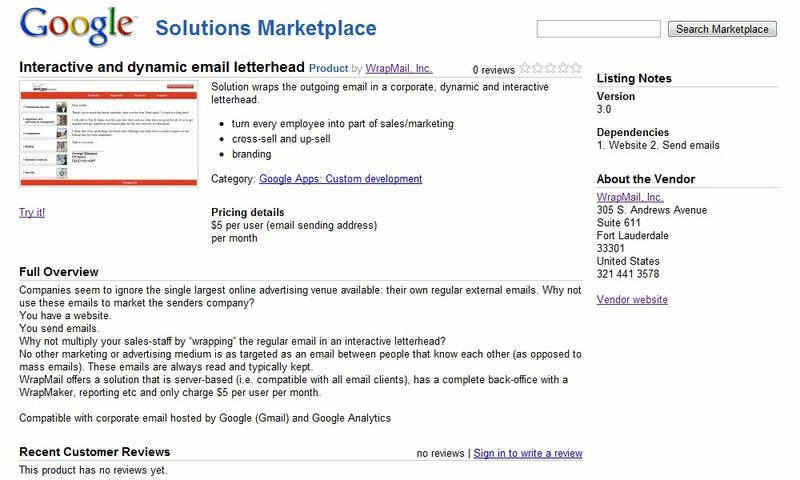 WrapMail for Business is now part of the Google Solutions Marketplace. WrapMail today launched Royal Pacific as its first client in Bangkok. 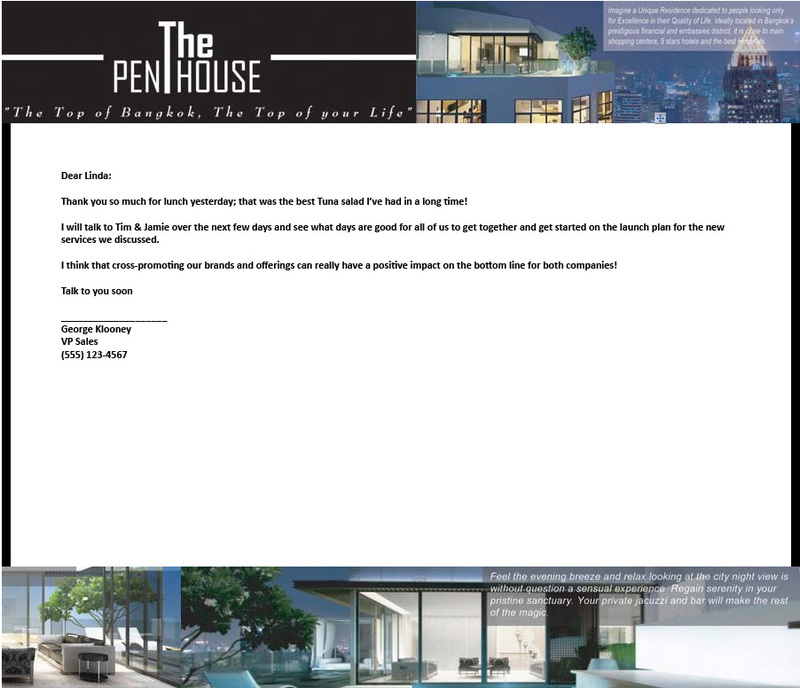 Royal Pacific will initially use WrapMail to brand and market “The Penthouse” which is its latest apartment development in downtown Bangkok.